With no fears left to face, Dusty, the brave voice of courage that the mind had once relied on, wants nothing more than to spend his days sitting on a rocking chair with his scrapbook drinking ice-cold Cerebrum Cider. Led to believe that he had been forgotten when the mind had stopped challenging itself, Dusty is now used to enjoying a particularly grumpy and isolated existence – something that his unwaveringly cheerful friend Piper will soon shatter. That’s because Figment has looked to portray how your mind works to overcome trauma. When a car crash leaves a father in a life-threatening condition, his mind is overrun with troubled thoughts that allow nightmares to start spreading fear and devouring despair wherever they go. When the Fear of Loss steals Dusty’s scrapbook, the semi-retired hero retrieves his wooden sword from a junk heap and sets out to defeat the nightmares and, in the process, restore the courage that the mind has somehow lost. The mind is a curious place to explore, where, racked with depression, clouds unendingly pour rain down on those that dwell in Cerebrum City. The occupants, named after emotions that will be familiar to all, are hiding from the marauding nightmares – the raindrops that drip from their roofs falling in rhythm with the accompanying soundtrack. This musical adventure is no sudden rival to Hellblade: Senua’s Sacrifice, but it lightly touches on the pressure, and perhaps tedium, that surrounds becoming an adult, resulting in an experience that is undeniably a meaningful one even if the game’s more poignant moments can sometimes feel flat. In a world where lily pads, pencils, books, post-it notes, push pins and trumpet pistons are used to create paths for you to explore ever deeper into the mind, it shouldn’t come as a surprise to see that same creativity used to create puzzles that you will need to overcome. There are some brilliant conundrums, too, whether that be memorising coloured note patterns to then hammer them out on an oversized piano, using a fishy looking plant to tug a bookworm out of a propeller-powered apple balloon contraption, reflecting booger balls to recover instruments to awaken the melody maker, or using a wind-up key on the Train of Thought to then kick it along the track. However, between this more standout puzzle design, the more minor puzzles that are used to elongate the experience can become repetitive and feel like a chore, even in the five or so hours that you will need to spend to see Figment through to completion. That comes in the countless times that you will have to slot metal discs into elevators, collect coloured synapse batteries to deposit in sockets, recover handles to place and then twizzle or when you shove Enigma boxes around to place on weights. With an increasing need for backtracking, I couldn’t help but see these as unnecessary padding that, in some ways, could have resulted in a far tighter experience if reduced in number. fill a tube that, once full, will increase your maximum health – not that Figment ever becomes tough enough to feel like you ever needed it. Of course, your main goal is to take out the nightmares. The Plague is smogging Freedom Isles with flasks of his bad breath and rotten teeth are falling from the sky, The Spider Queen commands her arachnid minions to attack you in Clockwork Town, and you will be challenged to overcome waves of despair created by the Fear of Loss using Shell Creatures for protection in Pathways. The nightmares each have their own musical styles that they communicate through, whether that be in rhyme, light jazz or heavy metal, and the banter between them with Dusty and Piper usually results in many bad puns in the lead up to the boss battle. It is the characterisation of the nightmares that remains strong here, as, to be honest, the encounters themselves aren’t a strong element to the game as a whole. There is more than enough to appreciate about the painterly art direction, though, that breathes life into the surreal world that exists in the mind. It’s a weird and wonderful place to be, and when you’re not dodging clock hands and pendulums in Clockwork Town you’re floating past unpaid bills, books and to-do lists in Pathways where the freshest memories exist. 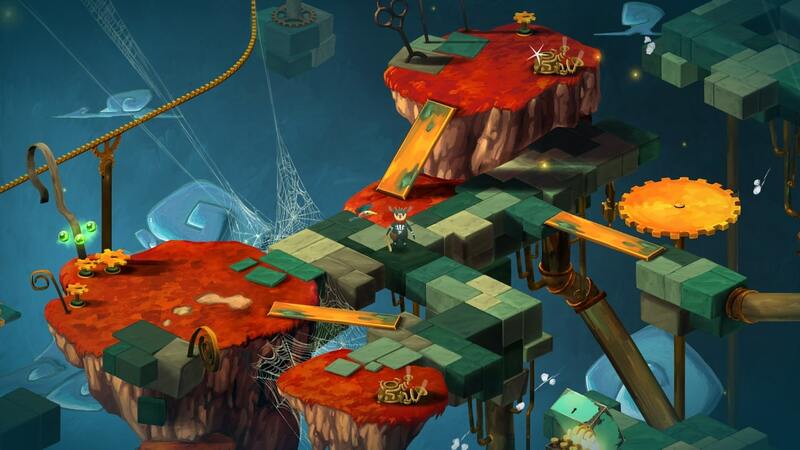 Figment leaves some of its best visuals right until the very end, so, if it’s a game that has piqued your interest so far, that’s something to look forward to. Once the credits start rolling, there’s little reason to return. You can hunt out the hidden Remembrane collectables, which are forgotten memories tinged with as much happiness as sadness that reveal more about whose mind you are exploring. I haven’t managed to find them all but these are often placed behind more difficult puzzles and, looking around online, it doesn’t appear that there’s a reward that awaits you for persevering to recover them all. Your quest to help Dusty bring peace to the mind again is memorable, even if the adventure is an uneven one. It’s a journey that’s ridden with cringeworthy puns, but made all the more worthwhile thanks to the way that Dusty and Piper bounce off one another and take comfort in the silliness of it all. The lesson that Figment imparts, though, is that if you can summon up enough courage you can fight through your fears rather than let them cripple you forever. The bad jokes thrown in letting you shake off some nerves along the way.